Every negotiator has had to deal with a know-it-all who is more interested in showing off his or her knowledge than in moving a business negotiation to a successful outcome. The three major types of know-it-all — The Instructor, The Intimidator and The Impostor — and the threats they represent to successful negotiations. 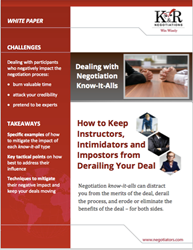 Strategies negotiators can use to mitigate a know-it-all’s negative influence and keep their deal discussions on track. Mini-case studies illustrating how the K&R team dealt with situations involving each type of know-it-all. Mladen Kresic is founder and CEO of K&R Negotiations LLC. He has more than 30 years’ experience negotiating business transactions both as a lawyer and businessman. Prior to forming K&R he served as counsel to a number of different IBM businesses and as General Counsel and Board member of Bristol Technology. He has appeared as a guest lecturer at the MIT Enterprise Forum, Yale School of Business and a keynote speaker with the International Licensing Executives Society. K&R Negotiation Associates, LLC, is a consulting firm specializing in structuring and negotiating business transactions around the world. The company is comprised of professional negotiators, sales executives, and business attorneys. K&R professionals average over 20 years of professional negotiation experience and apply a results-driven methodology to change sales and negotiation behaviors and improve negotiating success. K&R’s clients include Fortune 200 companies such as IBM, Microsoft, Cisco, EMC and Xerox, as well as smaller companies such as Merkle, Aricent and Priceline. For more information, please visit http://www.negotiators.com.